More Shakespeare! This time, it’s Macbeth: Gillyflower, youngest of the three witches, is obsessed with revenge against the Thane of Glamis, and all the play’s events proceed from her desire for his death. We don’t find out until the last quarter or so of the book why she seeks revenge, but it’s an interesting twist and complexification. The witches are all marginalized women, living in the forest for one reason or another. A local convent feeds & trades with them, and they supply villagers with herbal remedies—in short, basically what you’d expect “real” witches to be like. The summoning of Hecate is treated as supernatural, but nothing else is; a lot of the supernatural-or-madness events in the play are orchestrated by Gilly, aided by occasionally slipping Macbeth hallucinogenic poisons. She does this, more or less inevitably, by cutting her hair and going to work as a scullery boy in Macbeth’s household. When there, she befriends Fleance and starts taking fighting lessons with him. It’s an interesting example of the popular “castle life” story, showing us friendship & encouragement intermixed with casual brutality and utterly rigid enforcement of the class system. Macbeth himself is shown to be utterly charming & charismatic, casually saving Gilly’s life at the beginning of the book and later complimenting “him” on “his” bravery in defending a child from bullies, offering future training as a soldier. 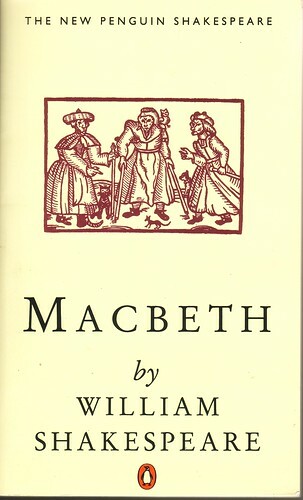 That all goes completely by the wayside later in the novel, when Macbeth decides that he really does want to be King, and he starts showing all the capricious evil that we see from him at the same point in the play. It’s a very dramatic character change, but we’re seeing him through the eyes of a young woman (early teens, by my guess… not that “teens” has any meaning beyond the numeric at that time) who has every reason to hate him, and indeed to force herself to hate him even more. I haven’t talked about Lady Macbeth, and part of that is that there’s a huge plot spoiler there, which we find out in the backstory about three-quarters of the way through the book and which I’m not going to give away. She is not treated at all sympathetically, but again, that’s an entirely understandable position for our narrator to be in. One really interesting parallel that shows up throughout the book (rarely, but clearly) is with Midsummer Night’s Dream. Gilly is likened to the fairies, protean and manipulative, pulling barely visible strings and affecting the fate of nations. At the same time, she’s very clearly not the only manipulator involved. What originally drew me to this book was the cover on this edition—I can’t find a decent-sized image online, but it’s a good match for the New Penguin Shakespeare editions I used to use at A-level, right down to a printed reproduction of the matte cover texture. I had quite a hard time getting into The Third Witch, but after about a third of the way through I knew I was definitely going to finish, and would definitely want to write about it. Apparently it’s been optioned for a film; if it ever actually arrives, I’ll have to see it. This is a Baen Free Library book, which means you can buy, download, or read it online for free here.